Household cleaning means different things to different people. Some view it as one of those everyday jobs that simply has to be done, while others pay for professional services to take the hassle out of cleaning and guarantee a good end result. For some people, cleaning is a highly enjoyable experience that helps them to destress and clear their mind. It has even become something of a social media sensation, as the popularity of online influencers have shown. One description that is not very often applied to cleaning is ‘dangerous’. 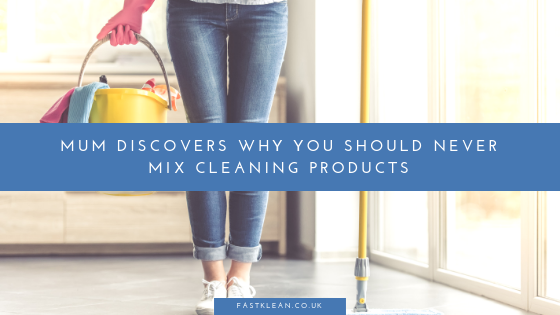 However, one practice that can be very risky is mixing separate products together, as a mother-of-three from Somerset recently discovered. Dominique Heath of Nailsea, a town just outside Bristol, found shortly after Christmas that her toilet was blocked, possibly because of her children attempting to flush too much toilet paper or dropping a toy down it. In an attempt to clear the loo, she first used two bottles of drain cleaner, and when that didn’t work, she emptied a three-litre bottle of bleach into the bowl, Bristol Live reported. Unbeknownst to Dominique, the separate chemicals began to react with one another and create chlorine gas – a potentially deadly substance that has been used as a chemical weapon in wars. The mum quickly realised something was very wrong when she started to inhale the dangerous vapours. She closed the bathroom door but soon had to take more drastic action, asking for help from a neighbour before calling 999. Three fire engines were dispatched and the emergency services quickly evacuated the house, before two firefighters wearing breathing apparatus entered the property. They opened all the windows and cleared the hazardous chemicals by flushing the toilet with plenty of water. A spokesperson for Avon Fire and Rescue confirmed that the firefighters “extensively diluted the chemicals” and retrieved the containers, before conducting a litmus test. Bleach and drain cleaner isn’t the only mixture of cleaning products that can produce harmful results. Bleach and ammonia – Produces chloramine vapour, which can burn the eyes and damage internal organs. Bleach and rubbing alcohol – Creates chloroform, which can cause unconsciousness and even death if inhaled in large quantities. Bleach and vinegar – Produces toxic chlorine gas. Vinegar and peroxide – Combines to create paracetic acid, which can irritate the eyes and skin. Really, the lesson is to always read the labels on cleaning products and never combine separate substances. Alternatively, just bring in the professionals from FastKlean to do the cleaning for you. Do you know of any specific product combinations to avoid? Let us know in the comments below.